Numerous nutritionists claim that oatmeal is the best option for our breakfast, as it is a rich source of fiber and nutrients needed for the day. They are among the most nutrient-dense foods we can consume, being full of antioxidant plant compounds, minerals, and vitamins. As well as small amounts of potassium, calcium, vitamin B6 (pyridoxine) and vitamin B3 (niacin). Moreover, this comes with only 303 calories, but 51 grams of carbs, 13 grams of protein, 5 grams of fat and 8 grams of fiber. Rolled oats are often the most popular choice since they are easily prepared and are higher in nutrients than instant oats. The consumption of oats for breakfast helps digestion, boosts the energy levels, accelerates metabolism, and controls the appetite. Therefore, they are a delicious way to lose extra pounds. Moreover, to avoid the morning rush, prepare them the night before, and eat them for breakfast! Pour the milk in a jar, add the nut butter, stir, and add the oats and the banana in thin slices. Stir again, close the jar, and refrigerate it. Add the almond milk in the morning, stir, and sprinkle with nuts. 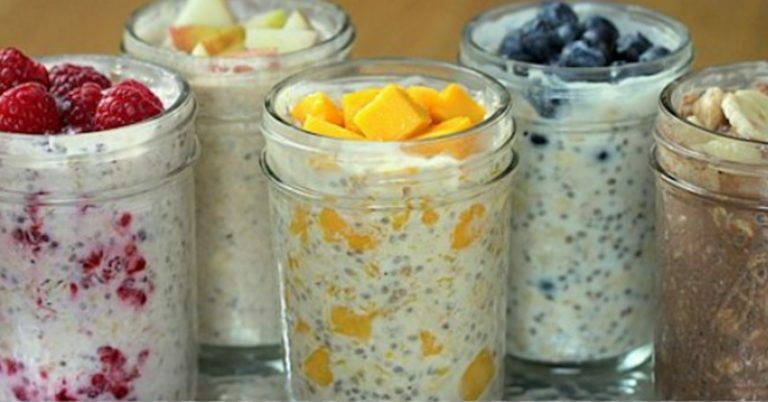 In a Mason jar, mix the ingredients, stir well, and refrigerate the mixture. In the morning, add some coconut milk, and enjoy it! In a glass Mason jar, mix the oats, milk, raspberries, cinnamon, extract, and raw honey, stir well, and close it. Leave it in the fridge overnight, and in the morning, just add the coconut and almonds. Stir again and enjoy!